NEW DELHI: Prime Minister Narendra Modi on Friday said the Centre's target was to double the farmers' income within five years. 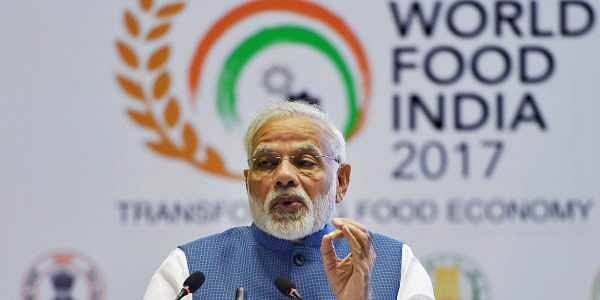 The prime minister, while addressing the gathering at the inaugural event of the World Food India 2017, said the farmers were prime to the efforts in food processing and that the government launched the Pradhan Mantri Kisan Sampada Yojana to create a world-class food processing infrastructure. “We have a stated target of doubling the farmers' income within five years. We launched the Pradhan Mantri Kisan Sampada Yojana to create a world-class food processing infrastructure. This will leverage an investment of USD 5 billion, benefit 2 million farmers and create more than half a million jobs over the next three years,” Prime Minister Modi said. He said the vast consumer base, rising income, favourable investment, climate and a government dedicated to Ease of Doing Business made India a place to be for the global food processing fraternity. “Food processing holds solutions to the nutrition security. Our coarse grains and millets have high nutritional value. They can withstand adverse agro-climatic conditions. Can we take up a venture based on these? This will raise incomes of farmers and also enhance nutrition levels,” the prime minister added. Stating food processing as a way of life in India, the prime minister said the product made of simple, home-based techniques, such as fermentation, resulted in the creation of the famous pickles, papads, chutneys and murabbas that "excite both the elite and the masses across the world." Referring to India as the fastest growing economy in the world, the prime minister said the Goods and Services Tax (GST), which has eliminated the multiple complexities of taxes, has played an important role in the Indian economy. “India has jumped 30 ranks this year in the World Bank Ease of Doing Business rankings. India was ranked number 1 in the world in 2016 in greenfield investment. India is also rapidly progressing on the Global Innovation Index, Global Logistics Index and Global Competitiveness Index,” he added. He said the private sector participation had been increasing in many segments of the value chain. However, more investment was required in contract farming, raw material sourcing and creating agri linkages. This was a clear opportunity for global chains. “There are opportunities in post-harvest management, like primary processing and storage, preservation infra, cold chain and refrigerated transportation. There is also immense potential for food processing and value addition in areas such as organic and fortified foods,” the prime minister asserted. The three day international event 'World Food India-2017', is organised by the Ministry of Food Processing Industries, Government of India in association with Confederation of Indian Industry (CII) from November 3-5. The event will be the largest gathering of investors, manufacturers, producers, food processors, policy makers, and organisations from the global food ecosystem.